Get These Men Some Lights! This past week, I had the privilege of seeing “Star Trek Into Darkness” and I was quite impressed with what J.J. Abrams did once again. I have been following this movie since I found out that Cumberbatch was going to be playing the villain and boy did he bring it. I mean really bring it. Like snapping necks and breaking legs bring it. BUT, I digress. “Star Trek Into Darkness” is J.J. Abrams second installment of the Star Trek series. 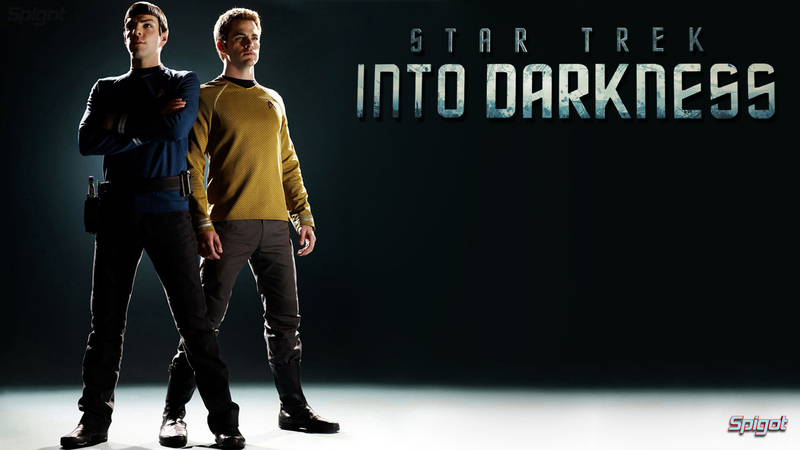 Chris Pine returns as James Tiberius Kirk with Zachary Quinto as Spock as well. Zoe Saldana as Uhura, SImon Pegg as Scotty, Karl Urban as Bones, Anton Yelchin as Chekov, and John Cho as Sulu all return to their respective roles as well. Simon Pegg is brilliant in this movie. He is the perfect Scotty, and I only know Scotty from all the skits that people have done based off of him, BUT, despite that, i still think he is quite good. This installment finds the crew observing and reporting and sometimes interfering with alien life, going against Star Fleet protocol, but all appears well within the crew. However, this blissful period ends when Kirk’s command is taken from him and Cumberbatch blows up a Star Fleet facility. Determine to bring the criminal to justice, Kirk sets out to find and kill/capture John Harrison, Cumberbatch. Let me begin by saying, Cumberbatch and Quinto completely and utterly stole this show. Pine did not/could not/ would not be able to perform as well as these two. Cumberbatch was ruthless and singular in his goals. Quinto was just as singular and ruthless when he needed to be. Excellent acting in both respects and I swear on all that is holy that Cumberbatch better become a villain. A Bond villain would be preferable. The script was also well written within this film. The conversations between Scotty and Kirk were great as were the conversations between Kirk and Spock. I thoroughly enjoyed their dialogue. It was witty, truthful, and often very powerful. It appeared that they truly cared for one another and they would go to the ends of the earth for one another. I also thought the story and action were interlaced quite well. There were slow parts but they served a purpose. Their was action but it illustrated a point. Things weren’t blown up for frivolous reasons, rather they showed something. So all in all, I really liked this movie. It was a separate story unto itself thus allowing it to stand alone as it’s own movie, which I think it could do quite well. J.J. Abrams knows his script, his characters, and his story. He doesn’t abuse fans and tread all over their beliefs, but rather he offers his own ideas while respecting the fan’s. Great movie. Check it out!